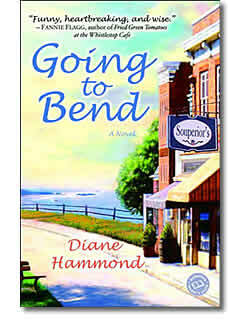 “Going to Bend” is a work so confident that Hammond has set herself a tough standard to beat in the future. It is tightly constructed, written in a deceptively loose style and has characters so real you’ll swear you could walk out of your home and go have a beer with them. “Going to Bend” is about about everyday survival, trying to live without bitterness, to love difficult people, to be decent and generous even when it hurts. Hammond is particularly good at portraying the pettiness of small-town life and at delineating the particulars of near-poverty -- beat-up cars, rundown houses, secondhand clothes, anxiety about the price of frozen chicken parts, fear that any minute you'll hit bottom.‘Going to Bend’ is as complicated, ambiguous, and unpredictable as life." "The people are so real, I wondered how the author had come to know some of the same people I did. She gave them heart. She gave them flaws. They come with an attitude, and a lot of love. If this is indeed a first novel, Diane Hammond is going to blow the socks off the fiction world. This is a spectacular entry into the genre." try to make ends meet in the "no-account" Oregon coastal fishing town of Hubbard in Hammond's shining first novel. Petie, the mother of two boys, is "small and hard and tight and flammable, like the wick of a candle," while Rose, the single mom of a teenage girl, is "a big soft woman of calm purpose and measurable serenity." They've just started supplying homemade soup for the new cafe in town, Souperior, owned by Nadine and Gordon Erickson, fraternal twins fresh from Southern California. Petie, a scrappy survivor of poverty and an abusive father, is given to spot-on observations: Nadine, is "all nerves, snip and anxiety" and "living proof that some people shouldn't give up smoking." Rose, with her gentle heart and tranquil solidity, has compassion for Nadine and especially for Gordon, who is dying of AIDS. When Gordon gives Rose the opportunity to write a cookbook-which she insists Petie illustrate-the women's lives radically change, as they give expression to their hidden talents and the future seems full of hope and promise. But life is never uncomplicated, and Hammond shines an unwavering light on a group of people who struggle to make do, yet who live their lives and cope with hardship with grace and dignity. Her clean, sharp prose, idiosyncratic dialogue and deep insight into relationships embellish this heartfelt debut. 1. Much of the action in Going to Bend happens over food preparation. What does soup represent in the lives of Petie and Rose? How is that different than its significance for Nadine and Gordon? 2. Kitchens are also centers for discussion, revelations, and turning points. What key scenes take place in kitchens? 3. As a young man, Schiff meets a redheaded girl at a carnival and, early in the book, vividly remembers the few hours they spent together. Later, he will associate her with Petie. Why? What characteristics and quirks do these characters hold in common—and why does Schiff find them appealing? 4. When Petie is young, she and Paula seek refuge in a gift shop from Old Man’s drinking. When a fragile teacup is broken, the shopkeeper gives it and a matching saucer to Petie. What is the significance of these objects to Petie? 5. Old Man Tyler and Petie live in a camp trailer in the woods behind Hubbard. Later, Jim Christie discovers the trailer and uses it for his own purposes. What role does the trailer play in Petie’s past and in later causing a disastrous rift between her and Rose? 6. Going to Bend explores the different kinds of love that can exist between husbands and wives, fathers and sons, mothers and daughters, and friends. How did those different kinds of love manifest themselves between the characters in Going to Bend? 7. Rose and Gordon become good friends. Why—what do they have in common? 8. In some sense, Going to Bend is a story about the effects of isolation—geographical isolation, psychic isolation, and isolation based on shame and secrecy. What are some examples of isolation and its effect on the characters and on their unfolding stories? 9. In the course of the book there is an unfolding tension between Jim Christie and Carissa that will ultimately have tragic results. What’s really going on between these two characters? 10. Eula Coolbaugh is one of the most important people in Petie’s life. Does Eula’s love for Petie differ from Paula Tyler’s? If so, how? 11. In a childhood visit to Camp Twelve, Petie is badly burned in a fire, and Old Man applies a poultice of ashes. What do these ashes signify, both then and at the book’s end? What role do they play in helping Petie to resolve grief? 12. Eula Coolbaugh may be Going to Bend’s only truly wise character. What wisdom does she impart to Petie that has a lasting effect on her life and decisions? Why? 13. The title Going to Bend has both a metaphorical and literal meaning. What are they, and how do they relate to the book’s main characters? 14. At several key moments in Petie’s life, she buries objects beneath a tree. What are the objects, what do they represent, and why does she bury them? 16. Jim Christie is an inarticulate man with a severely limited ability to communicate his feelings. How does Rose deal with this throughout the book, and what role does it play in the book’s climactic outcome? 17. Work creates tensions throughout the book, and everyone except for Paula Tyler and Eula Coolbaugh has a job. How do the characters regard their respective jobs at the start of the book? At the end? How do they suit each character? 18. Were any of the characters in Going to Bend reminiscent of people you’ve known in your own lives? If so, what were the resemblances? 19. Were there universal truths about people and relationships that were revealed in Going to Bend? If so, what were they, and how might they relate to, say, white-collar people living and working in an urban environment? 20. What do you think will happen to Petie and Rose after the book’s end? What would you like to see happen?